The Sunday bird walk went to Linley Valley in Nanaimo. The morning was mostly sunny with a few clouds and calm winds. A Merlin flew in and landed in a tall tree next to the trail giving us good long views. 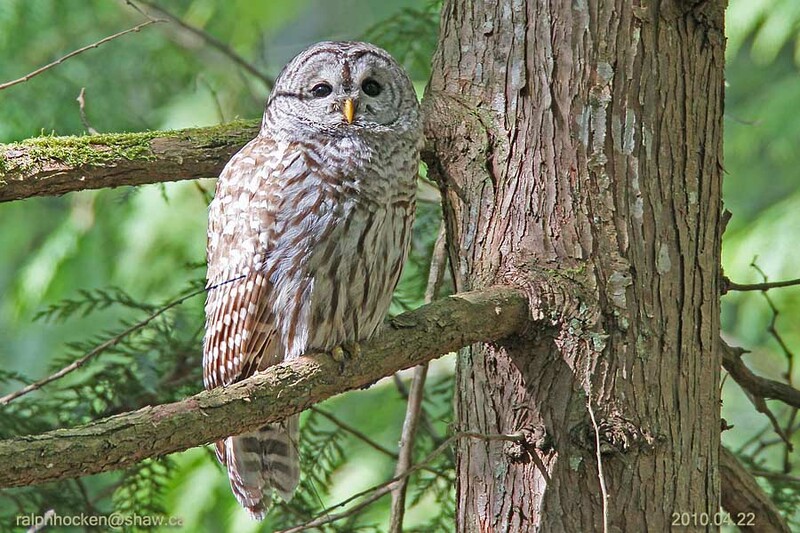 We spotted a Barred Owl perched off the trail and again we had great looks as the owl looked us all over. An Orange-crowned Warbler flew across the trail. We watched as a tiny tree frog sat motionless on a leaf. An injured bat made its way off the trail into the forest. 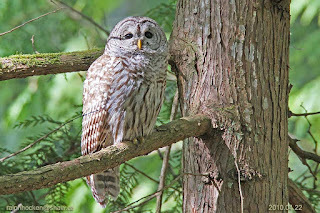 Barred Owl: Ralph Hocken Photo. A Black Swift was seen feeding a fledgling at the top of a very tall conifer tree, returning again and again to feed its offspring, at Deep Bay near the postal boxes. Everyone is welcome to join us for a 2-3 hour bird walk on the Sunday & Tuesday. We leave from the Store at 9 a.m. on Sunday Mornings and go to a different location in and around Nanaimo. The Tuesday bird walks have ended for the summer. They will resume on September 06, 2016. The Sunday bird walk on August 07, 2016 will be going to Neck Point Park in Nanaimo. Meet at the Birdstore at 9:00 a.m. or at the parking lot at Neck Point off Hammond Bay Road at about 9:20 a.m.
Marilynne and I stopped in at Deep Bay on July 27, near the postal boxes and saw two young Northern Rough-wing Swallows being feed on the hydro lines just above us. We heard and then saw a Black Swift feeding a fledgling at the top of a very tall conifer tree. We watched and heard the Swift returning again and again to feed its offspring. A very great sighting for sure, the first time I have ever seen the Black Swift feeding a youngster. The Sunday bird walk went to Springwood Park in Parksville. The morning was sunny with calm winds. A leucistic Common Raven flew overhead giving us great views. Willow Flycatchers and Pacific-slope Flycatchers were singing and entertaining us all morning. We saw a Black-throated Warbler high in the tall trees. A Western Tanager spent a long time preening itself on a branch just off the trail giving us great views. 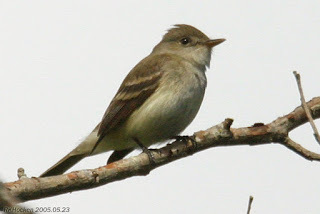 Willow Flycatcher: Ralph Hocken Photo. A Female Black-throated Gray Warbler was seen sitting in an Ocean Spray bush in the 2800 block of Skrimshire Road in Shawnigan Lake. Nine Common Nighthawks over a backyard along Meridian Way in Parksville this evening at about 8 p.m.
A family of four Pileated Woodpeckers- a male, female and two fledglings are visiting suet feeders in a backyard along Barrington Road in Nanaimo. 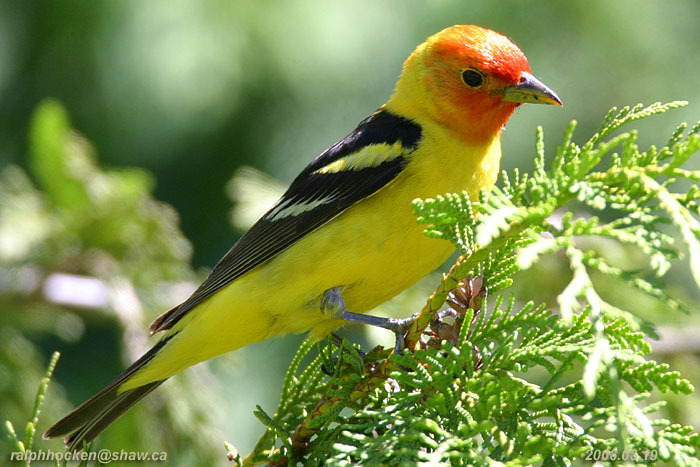 A male Western Tanager and a flock of Cedar Waxwings were seen in a backyard in Ladysmith. A Semipalmated Plover, over one hundred Western Sandpipers and Least Sandpipers, a Semipalmated Sandpiper and twelve Killdeer were seen at the Plumber Road mud flats in Parksville on the Englishman River Estuary. Common Loons, Pelagic Cormorants, Great Blue Herons, Canada Geese, two Surf Scoters, twenty Black-bellied Plovers, a Bonaparte Gull, twenty California Gulls, a Caspian Tern, three Pigeon Guillemot and twelve Black Oystercatchers were seen on the Strait of Georgia off the Plummer Road side of the Englishman in Parksville. Four Greater Yellowlegs and Purple Martin were seen at French Creek. Black Turnstones and Black-bellied Plovers were seen at Columbia Beach. A large flock of Common Nighthawks were seen at 6:30 p.m. over the 2500 block of Glenayr Drive, near Departure Bay, Nanaimo. A flock of fourteen Common Nighthawks were seen over the 2500 block of Glenayr Drive, near Departure Bay, Nanaimo. Everyone is welcome to join us for a 2-3 hour bird walk on the Sunday & Tuesday. We leave from the Store at 9 a.m. on Sunday Mornings and go to a different location in and around Nanaimo. The Tuesday bird walk has ended for the summer. They will resume on September 06, 2016. 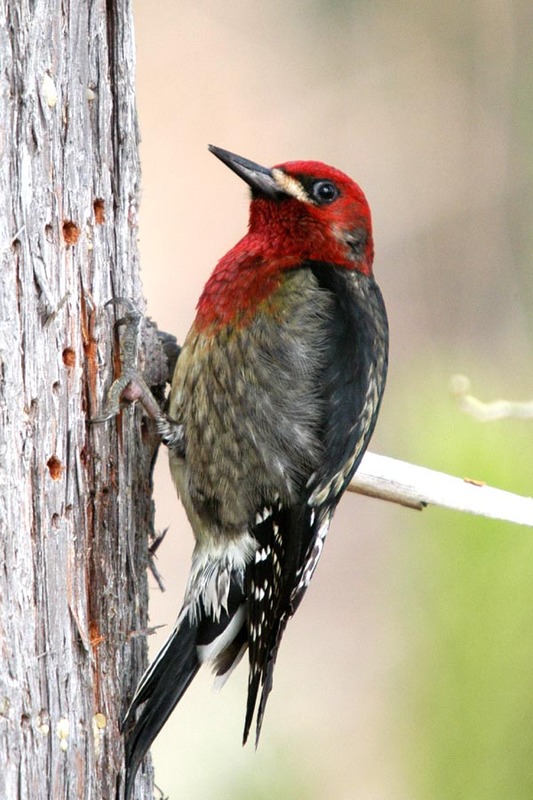 The Sunday bird walk on July 31, 2016 will be going to Linley Valley in Nanaimo. Meet at the Birdstore at 9:00 a.m. or at the end of Burma Road off Lost Lake Road in north Nanaimo at about 9:20 a.m.
A Semipalmated Plover, 100 Western Sandpipers, over 100 Least Sandpipers, a Semipalmated Sandpiper and twelve Killdeer were seen at the Plumber Road mud flats in Parksville on the Englishman River estuary. The Sunday bird walk went to the Ladysmith Harbour. The morning was sunny with calm winds. We saw a family of five River Otters just off shore near the parking lot at the start of the walk. Purple Martins were the highlight of the walk and we saw and heard them chatting overhead all morning. 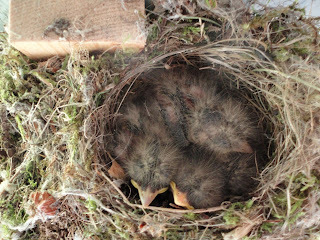 Four Purple Martin chicks were seen in the nest cam that has been set up along the dock. Three Pigeon Guillemots were spotted flying low over the water heading down the Strait of Georgia. We saw five Black Turnstones were seen resting along one of the docks along the water. 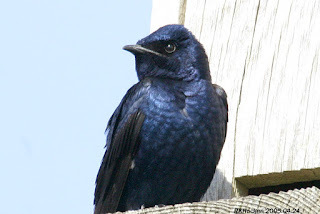 Purple Martin: Ralph Hocken Photo. Over eighty Common Nighthawks were seen from the VIU parking lot in Nanaimo. Highway 19A between Parksville and Qualicum Beach. A large number of Red Crossbills are frequenting feeders in Nanoose Bay. Over one hundred Least and Western Sandpipers, one Semipalmated Sandpiper, one Greater Yellowlegs and a Long-billed Dowitcher, along with a flock of Canada Geese were seen at the mud flats on the Plummer Road side of the Englishman River in Parksville. Two Pigeon Guillemots were seen off shore from the Plummer Road side of the Englishman River in Parksville. A Least Sandpiper was seen along the Millstone River Estuary in Nanaimo.
. Four Short-billed Dowitchers and twenty Western and Least Sandpipers were seen at Port Renfrew. The Sunday bird walk went to Buttertubs Marsh in Nanaimo. The morning was sunny with calm winds. Purple Martins, Violet-green Swallows, Barn Swallow, Tree Swallow and Northern Rough-wing Swallows were seen overhead all morning. Young fledgling Barn Swallows were perched on a branch just off the trail with an adult Swallow appearing regularly to feed them. A large flock of Bushtits was spotted feeding on a conifer next to the trail giving us great views. Common Yellowthroats and Wilson’s Warbler entertained us with their songs as we walked the trail. A large flock of Bushtits are feeding on a suet feeder along Boundary Crescent in Nanaimo. The Sunday bird walk on July 17, 2016 will be going to Ladysmith Harbour. 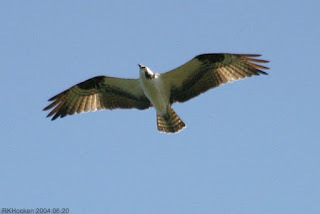 Meet at the Birdstore at 9:00 a.m. or at the left side of Transfer Beach parking area in Ladysmith at about 9:40 a.m. I was out birding this morning with John Purves. We saw a mixed flock of over seventy Western Sandpipers, Least Sandpipers and one Sanderling at the Plummer Road mudflats in Parksville. The Sunday bird walk went to Hemer Park in Cedar. The morning was sunny with calm winds. We heard and then spotted a Willow Flycatcher at the start of the walk. We spotted a Western Tanager next to the trail and then saw a total of six Western Tanagers during the morning. A Red-tailed Hawk was seen high up in the clouds over head Pacific-slope Flycatchers serenaded us throughout the morning and we had the good fortune to see two of them down low and close to the trail. An Osprey was observed as he perched in a tall conifer over us and then flew away. A Merlin was seen alongside Hemer Road as we left the parking lot, singing as he perched high in a conifer. The Tuesday bird walk went to Lot Ten, along the little Qualicum River, in north Qualicum Beach. The morning was sunny and hot but much cooler in the forest. We spotted a Black-throated Gray Warbler at the start of the walk, perched high up in a very tall tree. 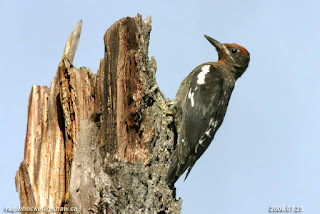 A Red-breasted Sapsucker flew into a tree next to the trail and began tapping sap holes in the tree. The Sapsucker was soon joined by a young fledgling Sapsucker who started feeding in the sap holes. We watched the pair with fascination for several minutes--a great sight to see. A Wilson’s Warbler was singing near the trail and the made an appearance in a short bush giving us great views. We spotted a Western Tanager feeding high in a cedar tree. The Tanager worked his way down the tree playing hide and seek with us and entertaining us for about twenty minutes. We ended the Tuesday Bird Walks for the season with a delicious BBQ. Thanks Callie, Carol, David and Linda.